(1) By Operation of Law- examples by birth in the U.S. or by birth abroad to U.S. citizens. Note: requires no affirmative action by the beneficiary. (2) Naturalization- requires an affirmative application and satisfaction of statutory eligibility requirements. Applicant must be lawfully admitted as a permanent resident. (a) Continuous Residence- for most residents continuous residence for a period of five years is required. Note: Residence is defined as one’s principal actual dwelling place, without regard to intent. See INA§101(a)(33). Exception(s): Persons married to U.S. citizens must reside in the United States for three years instead of five years. Note: The couple must be married and living in marital union for the entire three years, and the U.S. citizen spouse must have been a U.S. citizen throughout this period. (b) Physical Presence- which means “actually being physically present in the U.S. Most applications for naturalization must be physically present in the United States for at least half of the total required period of continuous residence. This means generally a person must be physically present in the U.S. for 30 of the 60 -month period. Spouses of U.S. citizens must be physically present for at least 18 out of the 36-month period. Important Note: An absence of more than 6 months but less than one year outside of the U.S. raises a rebuttable presumption of abandonment of continuous residency for naturalization purposes. An absence of one year or more breaks the continuous residence. Exceptions: There are exceptions for persons employed abroad with U.S. government agencies and U.S. companies. However, please contact a licensed immigration attorney to advise you how to preserve your residency before departing to work abroad for more than six months or more than one year. (c ) Reside within the State or District-where the application will be filed for at least three months immediately preceding the filing of the application. 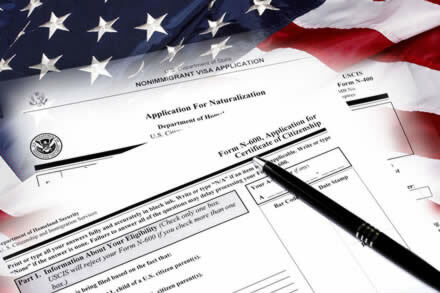 Note: By law a person may file a naturalization application three months (90 days) before their continuous residency requirement is completed. However, if an applicant files early he or she must reside within the state or district at least 3 months prior to the naturalization interview. The Applicant must be a person of good moral character generally good moral character is assessed during five-year period (known as the “statutory period”) immediately preceding the filing of the application (three years for applicants married to U.S. citizens). Note: A conviction of a crime during the statutory period will likely disqualify an applicant from being able to demonstrate the required good moral character for naturalization.